PAUL DRAYTON was born in the UK, in what used to be called the East Riding of Yorkshire. He was educated at The Royal Grammar School, High Wycombe, where he took the academic route of Latin, Greek and music. After passing the advanced performing diploma (piano) of the Royal Academy of Music at age sixteen, he went on to read for a degree in musicology at Oxford University followed by a postgraduate B. Mus. degree in composition. He has worked in a variety of musical fields as pianist, teacher, composer, conductor, writer and lecturer. As a pianist he has given recitals, played chamber music, and been the soloist in piano concertos by Grieg, Schumann, Tchaikovsky, Rachmaninov and others. Occasionally he has yielded to the urge to play jazz, and was also the keyboard player for a show celebrating the work of David Bowie. With the actor John Nettles (star of the TV series Bergerac and Midsomer Murders) he has written and presented evenings of words and music by Mozart (Dearest Papa) and by Puccini (One Fine Day). His many concerts as conductor of St. Austell Choral Society have included the first performance of his dramatic cantata The Lady of Shalott, a complete setting of Tennyson’s much-loved poem, for soprano and baritone solos, chorus and chamber orchestra. Paul’s music has been published, recorded and broadcast worldwide, and he has enjoyed a long relationship with the celebrated a cappella group The King’s Singers. Hear them perform his Master-Piece on You Tube, a whirlwind tour of Western musical styles. Giving the narration to a soprano soloist produced a frisson from the start – Kirsty Hopkins, whom we heard in Israel in Egypt last year, has exemplary clarity and articulation and was equally effective in both dramatic and tranquil sections, while baritone Robert Rice, taking over the role of Jesus at very short notice, excelled in the extremes of grave dignity and searing intensity – the familiar psalm ‘wings of a dove’ particularly moving. Tenor Edward Goater as Peter contrasted bravado with remorse, and bass Jamie W Hall’s High Priest and Pilate made the most of these establishment figures (especially in slightly pompous Latin). Drayton’s writing for the chorus gave plenty of opportunity to the upper as well as lower voices (Passion settings do tend to be male-heavy) whether in prayerful psalm, the interpolated poems – some splendid textures and dynamics here – or the muttering and howling of the increasingly angry crowd. Singing different words beneath a soloist is also a fine art, and I was particularly impressed with the ‘he was despised’ section. 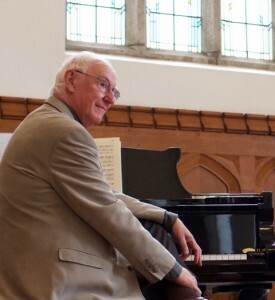 By contrast, Paul’s elementary piano compositions, notably the album Fun for Ten Fingers (published OUP), have been widely enjoyed by young beginners. He has sometimes turned his attention to manipulating words rather than notes. Now and again he yields to the temptation to write poetry and even admits to a novel (in MS). Comic musical texts abound too, particularly for The King’s Singers. Also Nero, a popular-style “ancient Roman” cantata for young people. On the serious side Paul wrote his own libretto for the opera The Hanging Oak, and made his own translation (from the Greek) for the Mark Passion. His book Unheard Melodies (available on Amazon) is an entertaining and light-hearted guide for adults who wish to delve a little below the surface of classical music. It is the product of many years teaching, developing the idea that “there is much more to music than meets the ear.” Once the effort is made to probe more deeply, all sorts of fascinating secrets are revealed. No technical knowledge or music-reading ability is needed. Copyright © 2019 Paul Drayton.